Omeka는 더블린 코어를 지원하는 오픈소스 웹 퍼블리싱 소프트웨어입니다. AtoM 등 아카이브 소프트웨어가 제공하지 못 하는 사용자 친화적 열람 서비스를 제공합니다. 아카이브의 핵심 콜렉션을 온라인 전시 컨텐츠로 쉽게 만들어 서비스하도록 해 줍니다. 회원가입 후 640MByte 무료 공간 한도 내에서만 사용 가능한 omeka.net 버전으로 나뉩니다. Omeka는 고인이 된 Roy Rosenzweig의 RRCHNM(Roy Rosenzweig Center for History and New Media)과 미네소타역사협회 공동 프로젝트로부터 시작되었습니다. RRCHNM은 조지메이슨 대학에 위치한 연구기관으로 Occupy Wall Street 운동을 아카이빙하기도 했습니다. 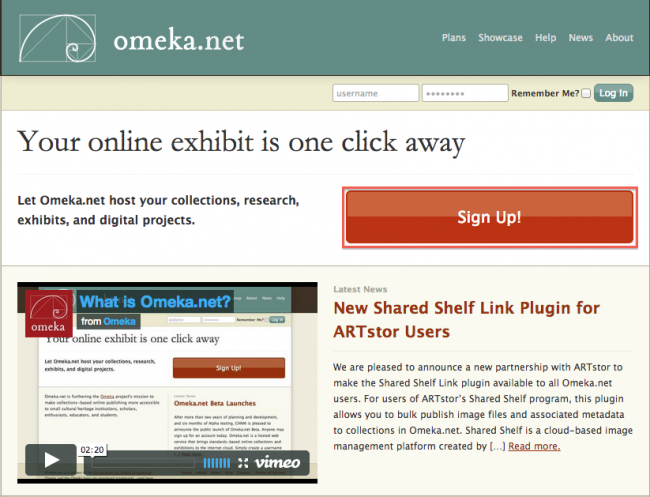 A partnership of RRCHNM and the Minnesota Historical Society, Omeka is a next-generation web publishing platform for museums, historical societies, scholars, enthusiasts, and educators. Omeka provides cultural institutions and individuals with easy-to-use software for publishing collections and creating attractive, standards-based, interoperable online exhibits. Free and open-source, Omeka is designed to satisfy the needs of institutions that lack technical staffs and large budgets. Bringing Web 2.0 technologies and approaches to historical and cultural websites, Omeka fosters the kind of user interaction and participation that is central to the mission of public scholarship and education.